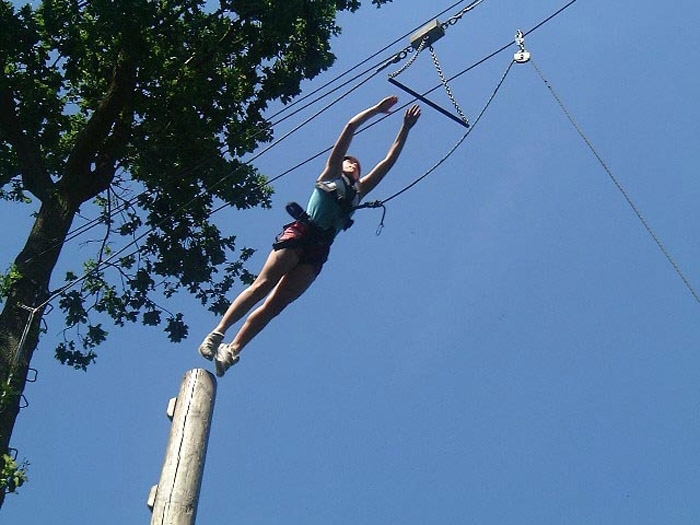 £17 per person for 3 hours (minimum group of 8).Take part in two high ropes activities from our course at Blackland Farm with one of our experienced instructors. 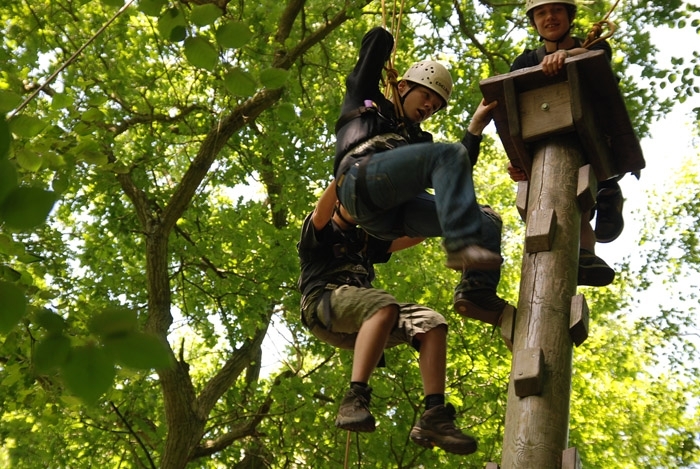 Meeting at our base at Blackland Farm, our instructor will kit you out with helmets and harnesses and take you to the first of your exciting high ropes challenges. Each challenge takes around 1.5 hours for the group to complete, so the total time is 3 hours. As all the challenges take around the same amount of time, just choose the two you prefer or call our office on 01273 487509 and ask for advice on the best ones to suit your group. Times – as with all parties, either morning (10.00am -1.00pm) or afternoon (2.00pm – 5.00pm) all year round; plus extra evening sessions from May – September (5.00pm – 8.00pm). You do need to choose in advance, and everyone in your group completes the same challenges, as other activities may be booked. See the Booking a Party Page for details on how to book. 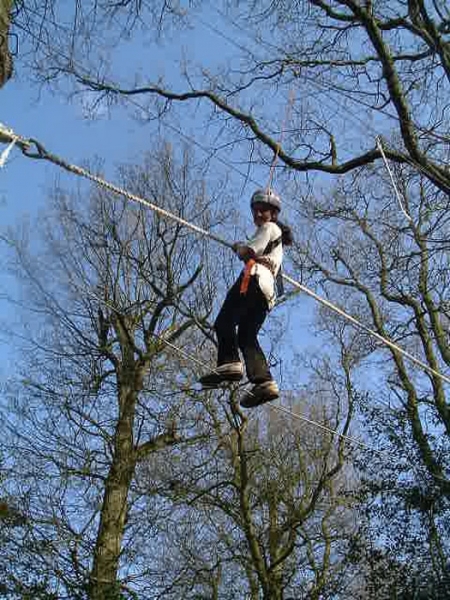 A solo element, walk the cable, holding a waist high rope for support, either by leaning forward or backwards. 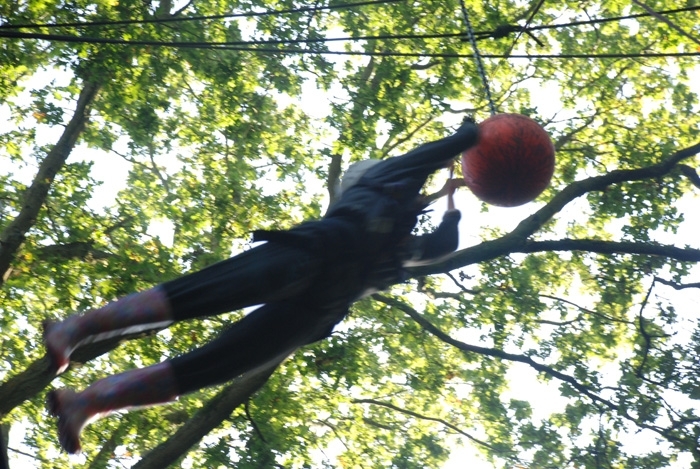 Once the gap has been crossed, climb higher into the trees for the return on a higher cable. Reach up to the hanging rope for help and take it along with you as far as it will go. Finally, stretch for the stationary hanging rope and jump off to finish. A solo element, climb the tree and step onto a horizontal log. Get your balance, and walk carefully along the log between two trees. 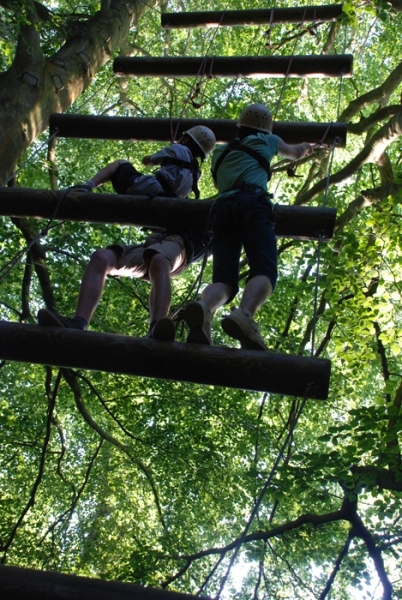 Climb higher onto a platform and step onto the swinging logs. Move from one to the other, holding on tightly, before reaching out to ring the bell and stepping off to finish. 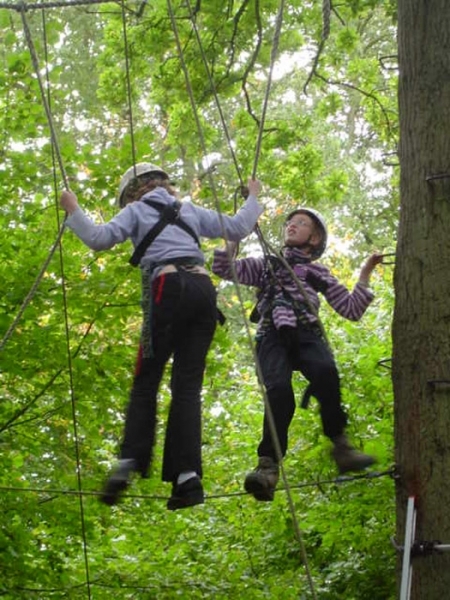 A solo element – the ultimate adrenaline rush for younger adventurers. 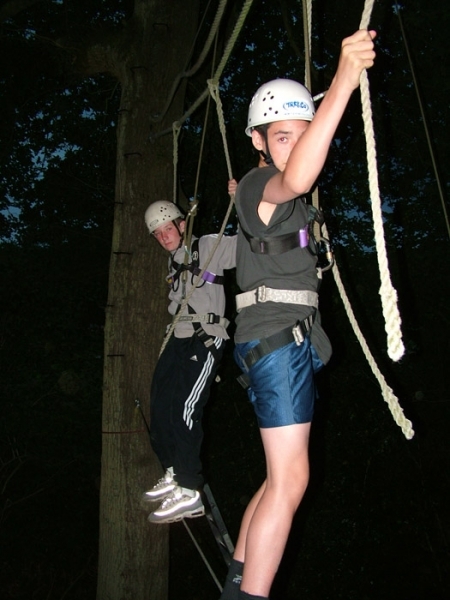 Climb the tree to the platform and compose yourself before jumping out into space to hit the hanging ball. Jump from the induction platform first and then if you want to, progress to climbing the smaller, higher platform and really testing your minerals. Groups of 2/3/4 teamwork element. The ultimate test of trust and teamwork. 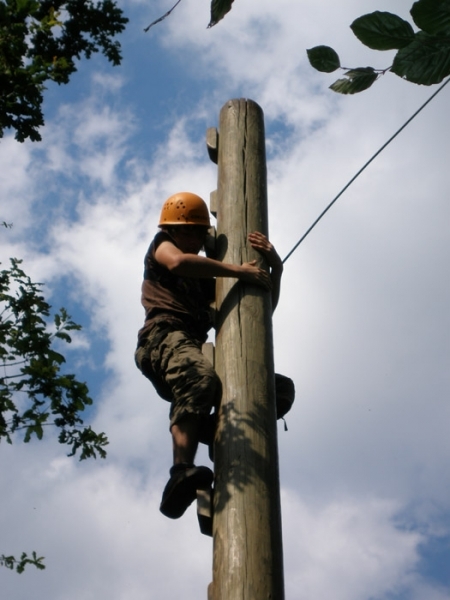 In groups of up to 4, climb the vertical pole to a small platform. Work together to get onto the top and cuddle together to fit onto the limited floor space. It’s a relief to get this far but only half of the challenge has been met. 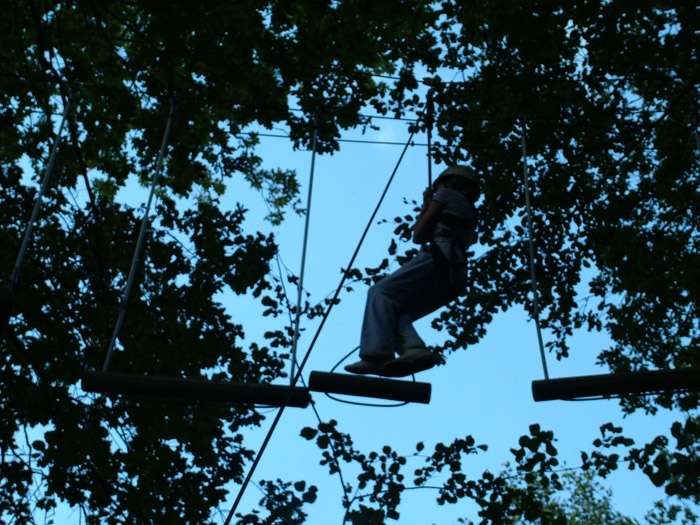 Now the climbers must hold hands and lean out backwards to balance before letting go and swinging off backwards. An extreme solo element and real test of character. Climb the vertical pole and ever so carefully climb onto the top. Stand on top of the pole and focus on the trapeze hanging out in front of you before diving out and hopefully catching it with both hands. Guaranteed to get your heart racing and legs shaking, you feel great when you make it back down to the ground! 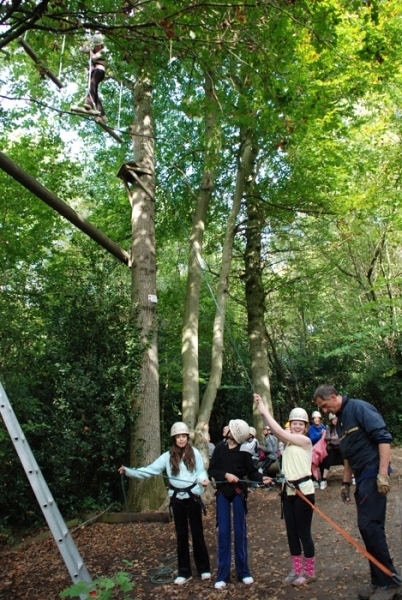 As a group of 3, climb the giant ladder high up into the trees. 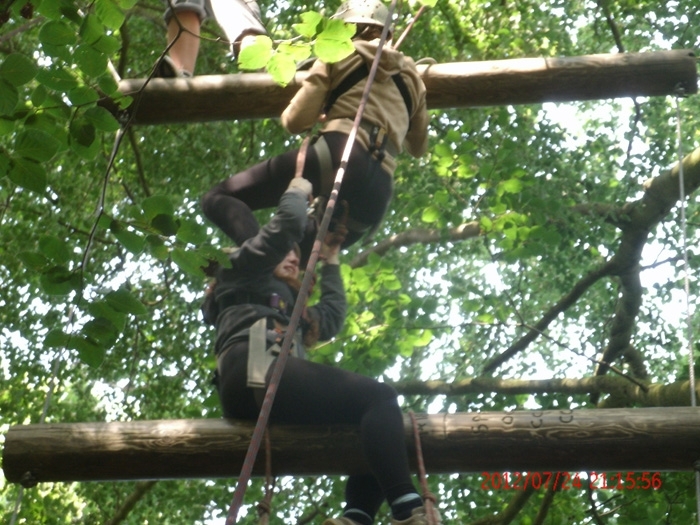 Large beams make up the rungs of the ladder and the climbers must work together and help each other to proceed. 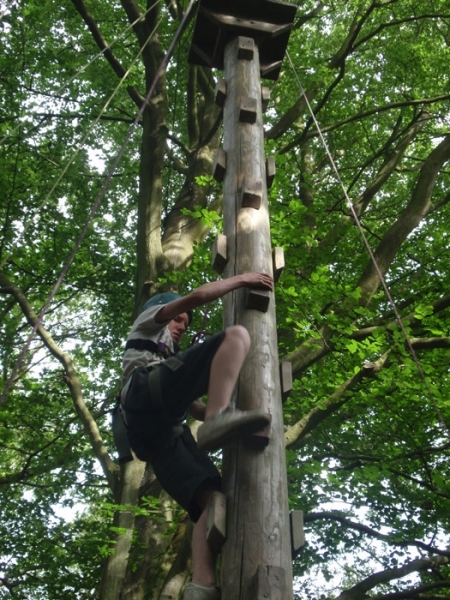 The higher you go, the bigger the challenge, as the gaps between the giant rungs increase. A strenuous climb, reaching the top rung takes you to the highest point of all.